OUI: A Tool and Technique for Optimizing Organizational Leadership | Bartell & Bartell, Ltd.
By Dr. Roderick J. Bartell, R.O.D.C. “How are we doing?” With varying degrees of style and success, this classic opener is asked in board rooms, executive suites and employee lunch rooms alike, but more often than not isn’t the question we really want to ask, “What are we doing? !” Sure. We want to know where we’ve been, where we are, where we’re going, and most importantly, how fast will we get there? For leaders with all of this in mind, is it any surprise that we keep hearing, “Are we there yet? 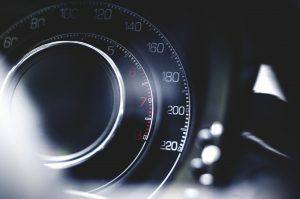 Are we there yet?” Like drivers, organizational leaders are expected to know these answers, see the big picture ahead and maintain perspective while driving at very high speeds. Organizational leaders drive businesses every day. Driving requires skills and tools. Enter the Organizational Speedometer; the Organizational Utility Index (OUI). The OUI, a composite of organizational factors, measures an organization’s alignment and, thus it’s return on investment. In other words, stronger organizational alignment creates greater organizational energy, health and profit. The OUI is broken into three parts and ranges from -100 to +200, which can be roughly compared to (organizational) miles per hour. On the left is Organizational Triage from 0 to -100 (standing still – driving backwards); in the middle is Maintenance Management from 0 to +100 (driving slowly to quickly); and on the right is High Performance Organization from +100 to +200 (driving very fast). 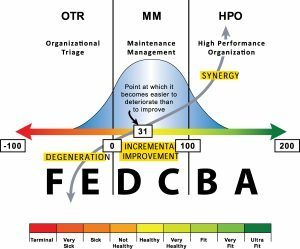 The middle of the bell curve indicates that Maintenance Management is (as the title would suggest) where most organization’s live and die, but there’s a catch. Above 31 points of alignment it is easier for the organization to improve. At 100 mph it shifts from linear to exponential improvement. As an organization slows below 31 mph it is easier for the organization to degenerate. At zero this degeneration becomes exponential (See Figure 1). The OUI is used at all levels of organizations from the organization as a whole to isolated work teams. At times an organization’s alignment is high while a work team within that organization is very low. Organizational scientists refer to such teams as “bleeders” because of their unmatched ability to drain resources and, in turn, profits. As one would imagine, the dynamics of an organization shift dramatically depending on the alignment of its pieces. Leaders who drive in the HPO feel like they’re flying jets while leaders of OTR feel like they’re running uphill, a very steep hill, in August. Because growth is exponential in HPO and OTR, a leader’s reaction time is short at best. Here’s an example: At -20 on the OUI, conditions begin to form that allow bankruptcy to occur. Remember, 31 is the tipping point for degeneration to begin, and below zero you’re not just in reverse anymore, you’re in neutral, going downhill backwards. A classic case is the demise of the financial consultant giant, Arthur Anderson, who dissolved, literally, in weeks. At this point some of you are wondering, “If a for-profit company ‘goes away’ at -40, why does the OUI measure to -100?” The answer’s simple. Not all companies are for-profit. Police departments, government agencies, school districts, etc. can go far below -40. Going “beyond bankruptcy” is made possible by the artificial life support of our tax dollars. However, the negative impact that this misalignment has on employees is so severe that unusual and abnormal coping behaviors, called organizational syndromes, form. At an OUI of -70 corruption can become institutionalized. When a company enters the zero to -100 arena, an organization development protocol called Organization Triage (OTR) is the required intervention for generating a reasonable chance of business recovery. Most business executives have spent very little time in this zone. To use an analogy, it is like a seasoned car driver that has thousands of hours driving under their belt, but maybe has only experienced sliding on “black ice” when going too fast around a corner for only a few seconds of their driving experience. It takes a preplanned strategy, quick and decisive leadership to execute the strategy and a flooding of information to the affected area to halt the slide, and stabilize the affected area. Such stabilization is needed to start the recovery process. If you’re driving an ’84 Pinto at 106 mph, your speed might be taking a serious toll on your team’s engine. Not to mention, it might be a bit rocky in the driver’s seat. Learn to hot-rod in a hurry; increase the speed and frequency of real-time feedback, install manufacturing processes such as TOC, Lean, Six Sigma, etc. and most importantly, get the right people in the right positions. In HPOs hiring the right people isn’t just an aim, it’s a necessity. Many have turned to profile-based customized assessment center technology to “take a peek under the hood” before they make a costly decision. In Maintenance Management external motivation and parent-child-like communication patterns are acceptable. In HPOs they’re like pulling the parking break. In an HPO employees are internally motivated, developed and managed. There are clear WIIFMs (What’s In It For Me’s?) built into all strategic plans. The communication is adult-like, and before and above all else, these employees are being led and are, in fact, leaders themselves. Leading in an HPO is not just “sitting up front” and traditional management just doesn’t work here. It is far too awkward and entirely too slow. True servant leadership defines HPOs and requires a visioning focal length far greater than one that would have sufficed in Maintenance Management. Mastery of clear visioning for senior leadership is a must. Many hot-rodded organizations with skillful drivers have glimpses of HPO when the organization reaches the 90’s. The most critical time for a company is when it is on this cusp of transitioning from a Maintenance Management to a High Performance Organization or stage “C” on your results. High performance is not “on” or “off.” There are days of 110 and days of 96. Properly designed, your company can achieve and remain in the OUI high performance range. An objective well worth the challenge and required to meet increasing global challenges.